I've taught many children to read in my experience as a classroom teacher and reading specialist. None have been as fun for me to watch acquire literacy as own child, Logan. It is so fun to watch your kid as they begin to figure out those first words on cereal boxes. Soon they are trying to read every label in the store. Eventually, you notice they are filling in the blanks when you read aloud to them. You begin to wonder, are they really reading this?? Once they head off to school, you start to confirm that your child is, indeed, controlling the reading process independently! I hope I'm not the only momma who gets chills when she hears her own flesh and blood reading fluently. Read the title and the author. Talk about the cover and make predictions about the book. You can go beyond the picture walk and spend a little time orienting the child to the language structures and vocabulary of the book as well. Marie Clay, author and founder of the reading recovery program, calls this a book orientation. A book orientation is similar to a picture walk. You orient the child to the meaning of the book, but you also spend time orienting the child to language structures that are in the book. For instance, if a book has a language pattern that might be confusing, you may want to read that little bit. You can also orient the child to the vocabulary in the book, and have the child spend time learning to look at print. You might also ork on a particular sight word and have the child find every occurrence of the word in the text. Use prompts when beginning readers are stuck. When a child is stuck on a word, try not to just say, "sound it out". While it is important to look at the print, reading is about getting the meaning of the text. Here are some prompts that will help your child look at the print and think about the meaning of the story. What would make sense there? Go back to the beginning and try it again. Look at the picture for help. Look at how the word begins. Make the first sound. What letter would you expect to see at the beginning of the word...? Are you right? When a child monitors his own reading, he becomes more independent as a reader and a problem solver. You may notice some behaviors while your child is reading. Try some of these prompts when your child seems stuck. Wait for 10 seconds and allow your child time to work it out independently. Say, "Why did you stop?" Say, "What did you notice?" Behavior: Your child makes an error in the reading and doesn't notice the error. Don't interrupt the reading. Allow your child to keep reading the story. They may notice that it doesn't make sense and return to the page. At the end of the story, return the the page and say something like, "You said, "(insert mistake), were you correct?" Help your child problem solve rather than just correcting his/her mistake. Behavior: Your child looks that the pictures and makes up a story, ignoring the print. It is important to encourage your early reader to use the picture for help. Don't discourage this behavior or cover the picture. It is important, however, to encourage your child to look at the print as well. 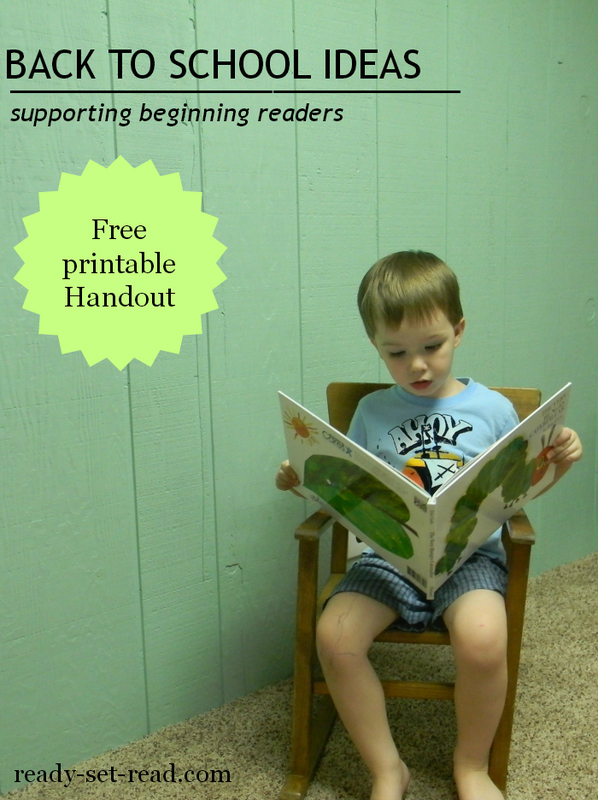 Use some of these prompts to help your child look at print. Read it with your finger. Did it match? After reading the story, talk about the story with your child. You don't have to drill your child with questions, but one or two questions about the story can be helpful. 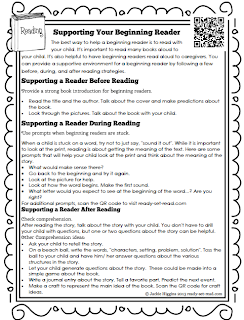 Marie Clay says, "Good questions give the message that the whole story was the point of the reading activity." Don't look for tiny details, ask open-ended questions about the overall meaning of the story. Ask your child to retell the story. On a beach ball, write the words, "characters, setting, problem, solution". Toss the ball to your child and have them answer questions about the various structures in the story. Let your child generate questions about the story. These could be made into a simple game about the book. Write a journal entry about the story. Tell a favorite part. Predict the next event. Answer a question about the book. Do you have a beginning reader in your house? I know this post will be very helpful to parents. Wonderfully laid out with helpful strategies. Miss Enigma is officially beginning first grade. She is very excited about learning to read. It's going to be a fun year! MacGyver struggled a bit with beginning reading. My Reading Recovery strategies became quite helpful. The great thing is we kept it very positive and he never knew he was a struggling reader! Today, at age 10, he loves reading and is an avid reader! These are such great suggestions and so important for parents of young readers to know! Thanks a bunch for sharing on the KBN Back-to-School blog hop!